[tps_footer]Shah Rukh Khan is one gem of a person. All in the industry loves him. People not only adore his dedication and success but also like the kind of person he is. Everyone feels delighted to work with him. One such actor who worked with him 2 years ago is Sonu Sood. ShahRukh and Sonu Sood us go ROFL in their 2014 blockbuster Happy New year. SRK played the role of Charlie whereas Sonu played the role of Jagmohan/Jag in the film. The film was a hilarious experience and Sonu made us laugh with his performance. Both the actors even bonded well during the promotions of HNY. Well, seems like Sonu is really missing King Khan and hence he tweeted about the same to SRK. 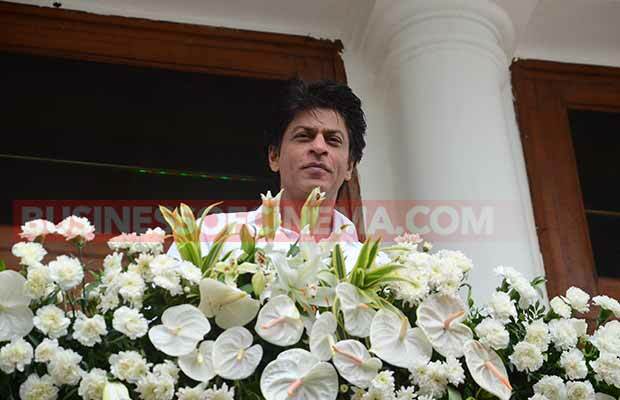 Initially, Baadshah of Bollywood took to his Twitter to express his happiness of working with good people. In reply to his tweet, Sonu tweeted how much he is missing SRK and working with him. 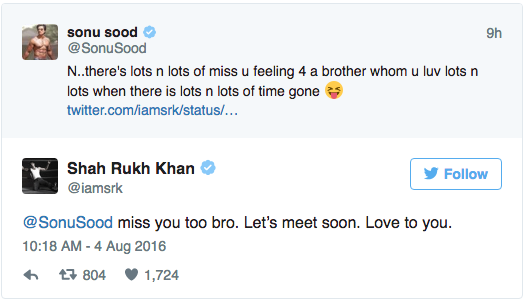 The Dilwale actor replied to Sonu and said he misses him too. Next article#FridayThrowback: Have A Look At Birthday Girl Kajol’s Rare And Interesting Pictures!